When you stock the pantry like I do, it’s important to keep track of the contents and use them within a reasonable timeframe. With ingredients like pickled cherries and grapes, citrus aigre doux, preserved lemons, pickled kumquats, lots of improvisation is possible. The pickled grapes came from a wonderful small volume called Fine Preserving, written by Catherine Plagemann and annotated by M.F.K. Fisher. I’ve gradually been cooking my way through this cookbook, adding another layer of annotations, a project that has been a blast. For the dressing, I typically use a combination of mayonnaise and sour cream in equal proportions, flavored heavily with tarragon vinegar and either fresh or pickled tarragon leaves. 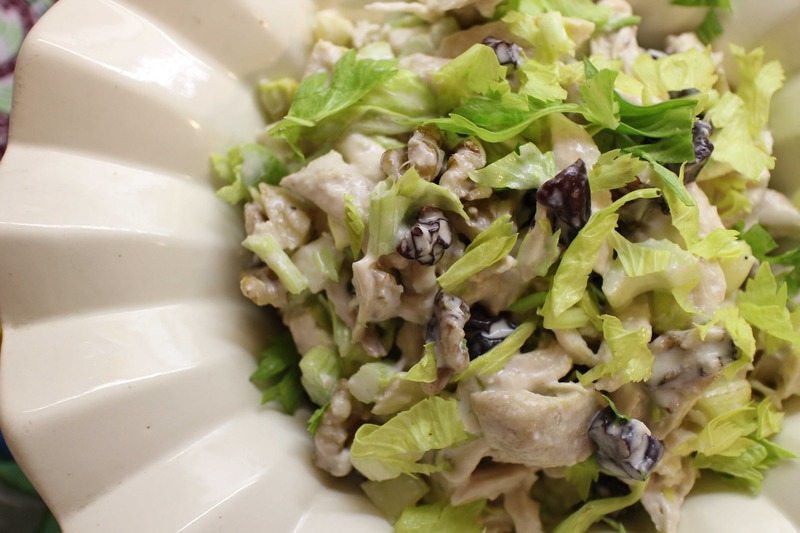 This time, I used the pickling liquid from the grapes, along with chopped grapes, walnuts, celery and celery leaves. I know pickled grapes sound like an odd condiment, but they have an alluring flavor — piquant with a hint of spice from the cinnamon stick that goes into the jar. 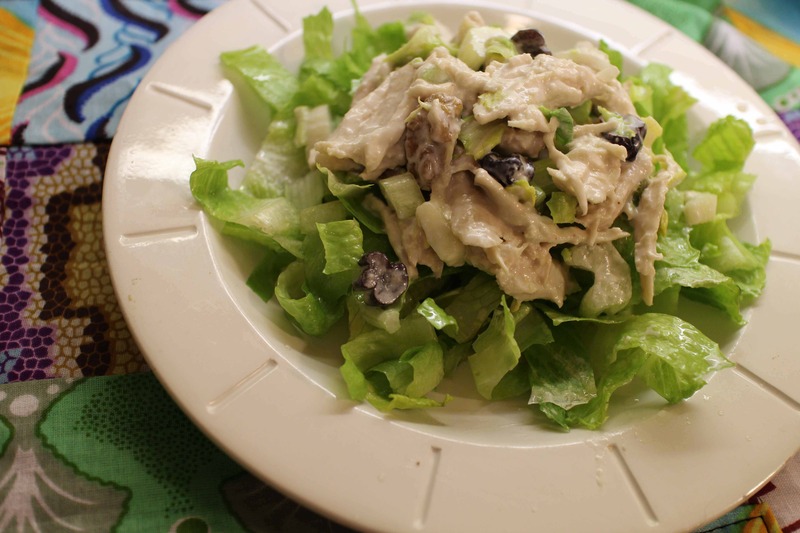 They were great in the salad, especially with the occasional surprise bite of grapes and the crunch provided by the celery and walnuts. 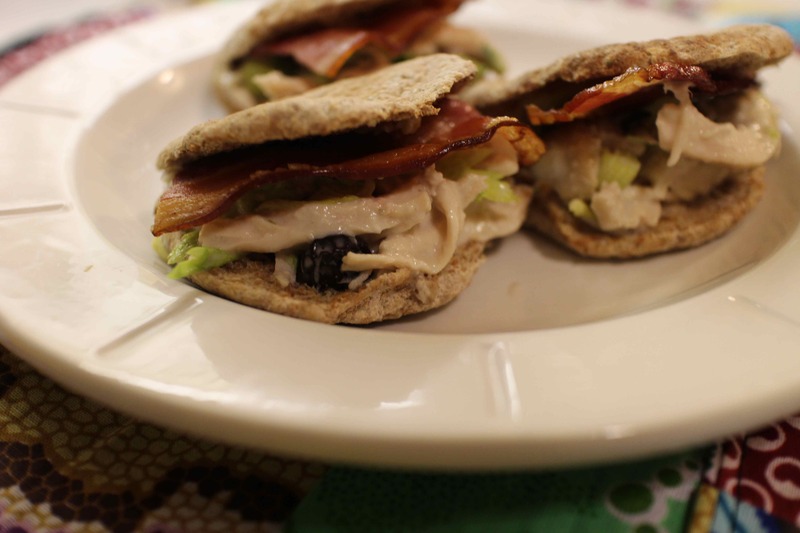 We served this in typical his and hers mode: his on mini whole wheat pitas with bacon, mine on a crunchy green salad dressed with the grape pickling liquid and walnut oil.